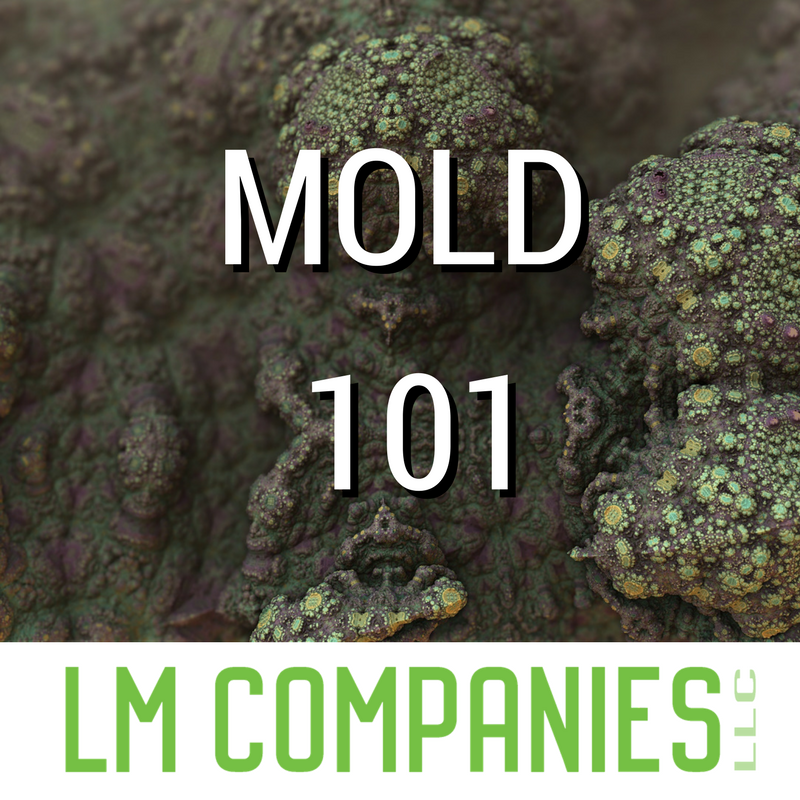 Mold 101 – Everything you need to know. Northeast Ohio temperature increase causing melting winter’s snow into water. This moisture that comes with the warmer weather creates some ideal conditions for mold to blossom in and around your structure and facilities. CDC and ODH (center for disease control and Ohio Department of Health) tell people to call a certified CMRC (Mold Remediation Contractor) or CIH (Certified Industrial Hygienists) these above stated professional can test and write a proper protocol for the Remediation. Roof water leaks or Ice Damming and broken downspouts on your structure this past winter can be the on-set for Mold / Microbial Contamination. Water enters the structure, heated up causing condensation (high levels of relative humidity) and then comes into contact with a dormant spore. This spore now has a source of food (water). This spore now can start to colonize as long as the water or relative humidity is available. Cardboard, Wood and Drywall on outside wall of a structure is where most Mold or Microbial Contamination will occur. Water or High levels of Humidity is a food source for mold to thrive and survive. You’ll want to be aware of the health risks and other dangers of mold in your structure or facilities, as well as the importance of proper written protocol for mold removal once it’s been located. Ideal Conditions for Mold – Where does it Appear? With over 100,000 mold species globally even in Antarctica, although frozen remember: “Mold” stops to thrive in temperatures at 31 degrees Fahrenheit and low levels of humidity. Mold found on the exterior of the structure has its place in the environment and ecosystem. Example: like in leaf piles, molds are tasked with quickening decomposition and consuming massive quantities of dead plant matter. Inside your structure and facilities, we bring in mold. Example: you have mold to thank for the antibiotics as well as the delightful cheeses and the leftovers we eat. Uninvited mold inside your structure can lead to serious problems, anywhere moisture hangs around – in your bathroom after a steamy shower, in a damp basement, or underneath a leaky sink – is the ideal breeding ground for mold. Structural value can diminish if mold is overlooked and wood rot occurs not to say you could have other invited guest such like termites. If the humidity levels in any areas of your structure are above 50-60%, you’re putting yourself, and others at risk. Mycotoxin is a toxic secondary metabolite produced by organisms of the fungi kingdom, commonly known as molds. The term ‘mycotoxin’ is usually reserved for the toxic chemical products produced by fungi that readily colonize crops. One mold species may produce many different mycotoxins, and the same mycotoxin may be produced by several species. Once released into the air this can cause asthma attacks in people who have been diagnosed with asthma, and otherwise, children who have been known to be exposed may develop symptoms as well. Molds reproduce by releasing spores into the air that can trigger allergic reactions as well. Such milder symptoms include those similar to seasonal allergies – stuffy nose, sore throat, coughing or wheezing, red and itchy eyes, and even skin irritation. People with allergies to mold will have more severe reactions. Elderly and young children with weakened or underdeveloped immune systems or chronic lung diseases may end up with serious lung infections when they are exposed to mold. Fungi have a nucleus in their cells and bacteria do not. Fungi are eukaryotes, that their DNA is enclosed in a nucleus which is separated from the cytoplasm by a nuclear membrane. Bacteria are known as prokaryotes that is their DNA is not separate from the cytoplasm in a nucleus. Once you notice surface staining, drywall or floorboards soft or catch a smell of stale old locked up a house, your mold problem is likely too large for you to tackle safely on your own. By disturbing mold contamination without taking the proper precautions used by mold removal professionals, like LM Companies LLC, you risk overlooking part of your mold problem and endangering yourself and your loved ones by spreading high concentrations of spores and mycotoxins throughout your home. To ensure the mold contamination does not spread to the rest of your home, mold remediation professionals such as LM Companies LLC isolate the affected area by sealing it off, taping off any ductwork, using specialized equipment to capture the contaminants and purify the air. Most importantly, the source of the moisture problem must be identified and resolved to make sure your mold remediation successful. It only takes 24-48 hours for mold to begin growing on surfaces in a damp environment. This entry was posted in BLOG and tagged dangerous mold, mold, mold exposure, understanding mold dangers.